Whoa. I was not expecting the things that happen in Barely Breathing by Rebecca Donovan to happen. But they did. And now that I've finished reading this book my heart is aching to know how Emma's story will finish in the next book in the series, Out of Breath. There were things about the abuse that Emma suffers in Reason to Breathe that left me feeling a little bit uneasy and that was in my head as I picked up Barely Breathing to read. It was a much different experience reading this book though, because I felt that the conflict and a lot of the problems that Emma faces in Barely Breathing were things that felt more believable and realistic, especially in the way that Emma deals with her missing memories of that night and in the choices that she makes. Because Emma has jumped from one bad situation to another. Instead of an abusive and hateful aunt, Emma is now living with her estranged mother, somebody who is a little bit emotionally unstable as well as being an alcoholic. It's only been a few short months since the horrific attack from Aunt Carol and Emma is still recovering physically and emotionally and then to deal with her mother's issues as well puts Emma into an uncomfortable situation. Despite having people in her life that she could turn to both with her own feelings - regarding her attack, her problems with living with her mother, the disappearance of Emma's uncle and cousins - but Emma doesn't speak out. Instead, she feels guilty and ashamed and suffers mostly in silence to her mom's drunken snide comments and outbursts and instead covers up for her mom's behaviour and tries to carry on with her own busy schedule as best as she can. Emma only ever seems to open up to Jonathan, her mother's much younger boyfriend, who seems to share Emma's dark past and violent nightmares, and they bond over sleepless nights and watching infomercials. Reading Barely Breathing was tough in parts. While I could understand some of the decisions that Emma makes during the course of the novel to cover up things and to carry on, I really just wanted to shake Emma as she continues to make the wrong choices with her mother and shutting out lovely Evan. 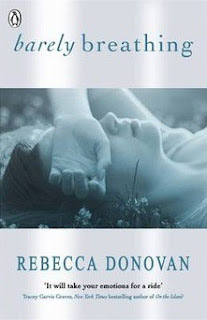 Rebecca Donovan does a brilliant job of writing really emotional stories that are incredibly addictive to read. Despite being a fairly large book, I managed to fly through both Reason to Breathe and Barely Breathing at a record pace and now I'm feeling bereft that Out of Breath isn't published until much later in the year! I have heard of Rebecca Donovan before and she sounds like a great writer. The abuse and conflict parts sound very tough to read but I'm glad they were handled well.